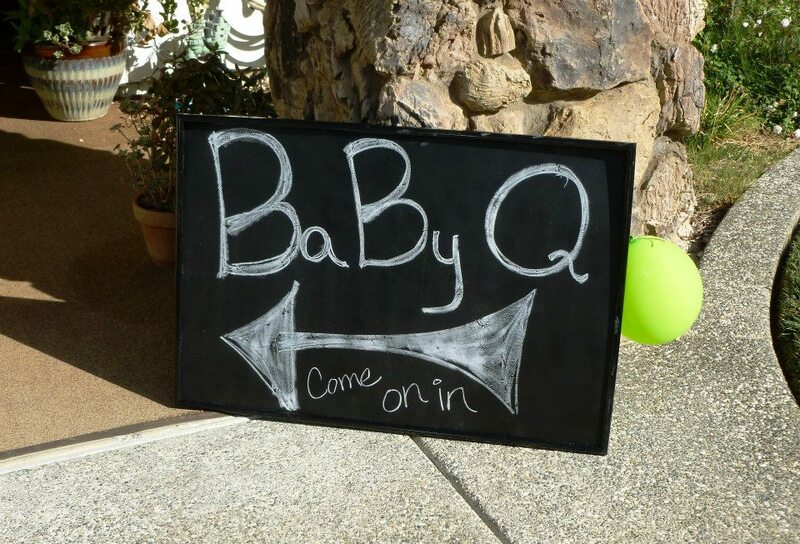 If you’ve decided to throw a BaByQ and are looking for some great decoration ideas out there, there are PLENTY around to come up with a cute BabyQ theme. 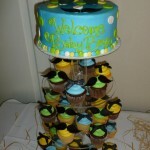 In our case since our friend was having a boy we decided to combine it with a “Welcome Little Man” theme. 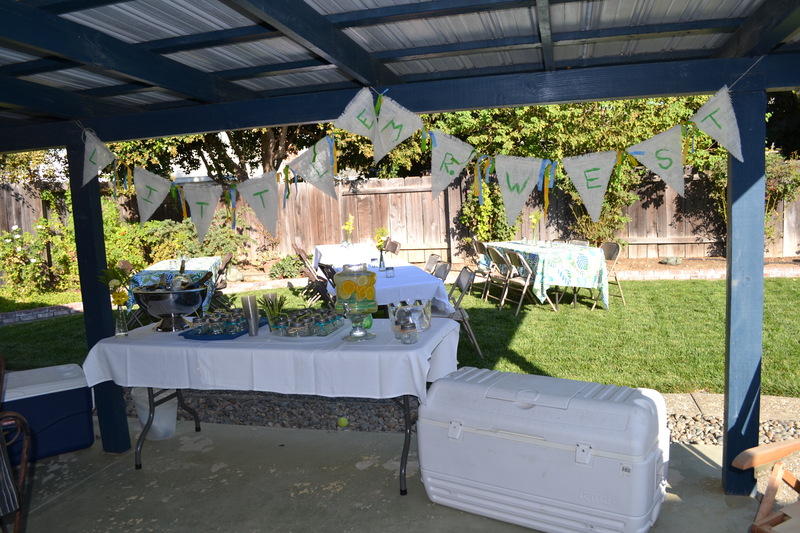 We wanted to keep it simple and not overdo it on the decorations everywhere but have some fun props and decorations to make it feel like a fun Backyard BBQ welcome party for the little man who is about to arrive! Then go to your local Arts & Crafts store and pick up some cute ribbon that goes with your theme party colors and tie little bows on the jars. Or Raffia is an easy option as well if you want to switch up the ribbon on different glasses like we did–this makes it easier for people to identify their own glass. Also these cute straws available in bulk for under $7 are so cute! They come in many different striped colors. They aren’t the most durable straws BUT for the price and getting 140+ of them, it’s okay to me as they really dressed up the mason jar mugs: Kikkerland Biodegradable Paper Straws, Blue and White Striped, Box of 144 . Raffia, Raffia, Raffia!! 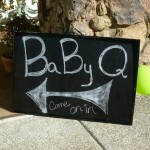 Such an affordable option for decorating and really ties in well with the BabyQ theme. 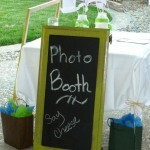 You can use it to decorate your drink, food or dessert table. 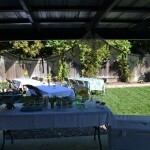 Or as ties to bunch the edge of tableclothes that are too long. 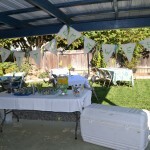 Having an extra bunch of Raffia on hand when getting ready to decorate is so helpful–those $2 spent can go a LONG way! 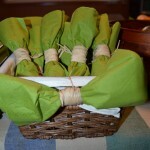 If you don’t have a craft store nearby you can also order online at Amazon: Joseph M. Stern Natural Raffia 8 Oz. Bow Tie Napkin & Silverware holder: We created great napkin & utensil combinations by wrapping the napkin around the utensils then wrapping a bunch of raffia around the middle–the end result ended up looking like a bow tie which fell in line perfectly with the “Welcome Mr. Man” theme! Pictures below. 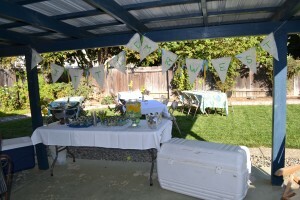 Burlap Banner – Another Kasey creationthat she will share with us how she made in a soon to come post on her own blog which I will link to here. 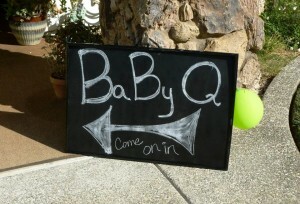 So cute and really made the backyard BaByQ theme!